Today’s Nice Price or Crack Pipe 323ci is claimed to be the car upon which tuner F2/Autolife developed their E36 suspension package. That might make its low stance acceptable, but what about its price? And we have a winnah! Yesterday’s Porsche 944 may have come with a lot of baggage—including the burning question of its actual model year—but that didn’t stop 69 percent of you from awarding its $3,500 price tag a Nice Price win. If you consider that the 944’s ancestor, the 914, once was a $3,500 car and now regularly commands two to three times that much, perhaps a cheap seat like this might just be a good long-term investment? That is of course, if you’ve got the space. You know who apparently doesn’t have the space? The seller of today’s 1999 BMW 323ci, that’s who. He opens his ad with the plaintive “[c]an’t have 2 cars anymore,” which makes him sound a little bit too much (or 2 much) like Sinhead O’Connor, but we’ll hopefully give that a pass. The car is a somewhat interesting beast. The claim is made in the ad that this specific car was used by the suspension tuning shop, Function & Form Autolife as the demo for their E36 suspension package. That package does of course include a lowered stance—which yes, I know is a bad word around here. Still, work with me, okay? There’s also a bit of M3 Single White Female going on here, with what’s claimed to be brakes, steering wheel, shift knob, armrest, and trunk lid from the hotter 3. The car doesn’t look like an M overall, and lacks the cool M3 seats, but it’s at least mostly tidy. That M3 badge on the boot lid should get the heave ho though. It’s making promises that the M52TU under the hood can’t keep. That engine is noted in the ad to “(have) the stock motor plastic on just in case you get your hood popped by the copz.” I simply don’t know why that might be an issue. Is it smuggling illegal aliens in there? Has it committed a series of bank robberies? Whatever, let’s just note that the Technical Update added variable valve timing to the DOHC six’s exhaust cam making it a double VANOS engine. That was good for 170 horsepower out of the gate. This one has a “carbon fiber intake” which has got to be good for about 20 points in the high school parking lot. Also, we don’t even get to see it. Outside of a missing fog lamp and some scuffs on the front bumper, the body is in great shape. Yes, the plastic lenses on the headlights are growing as yellow as an old man’s beard, but that’s a cheap and easy maintenance issue. The top is claimed to be tear-free, but there is something odd going on with the plastic rear window which seems to be detaching on the passenger side. The interior looks good, with only some worrying of the leather on the driver’s seat to belie its age. The car rocks a five-speed and the seller claims it operates without pops, grinds, ups or extras. It also comes with a clean title, as well as an OBDII reset tool just in case you get one of those pesky dashboard lights, I guess. These cars have a rap for electrical issues, but no mention is made of this car suffering from any gremlins. 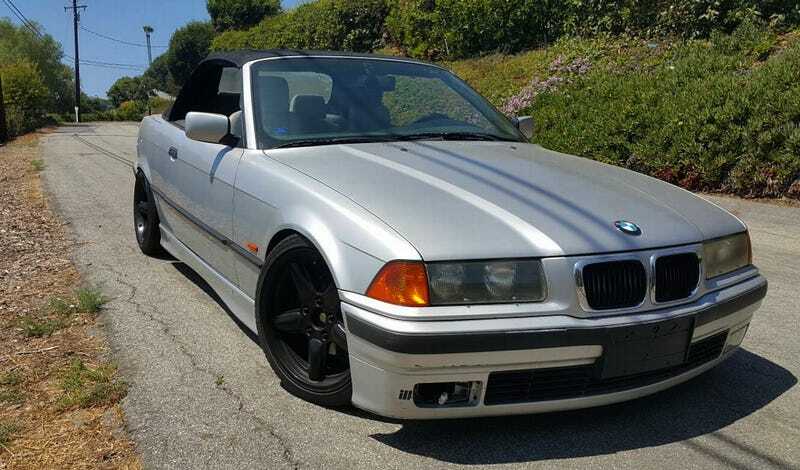 The price tag for this dropped and double VANOS’d Bimmer is a cool $6,000. That gets you a car that seems as though it would be an engaging cruiser, at least until the first steep apron or railroad crossing challenged its ride height. Hey, at least it doesn’t rock a fartcan exhaust! Well, I mean yet. What’s your take on this 323 and that $6,000 price? Does that seem like a fair price for some function and form? Or, do you think its price is too high for a suspension that’s so low? For $3,500, Could This &apos;1986&apos; Porsche 944 Be The Answer?